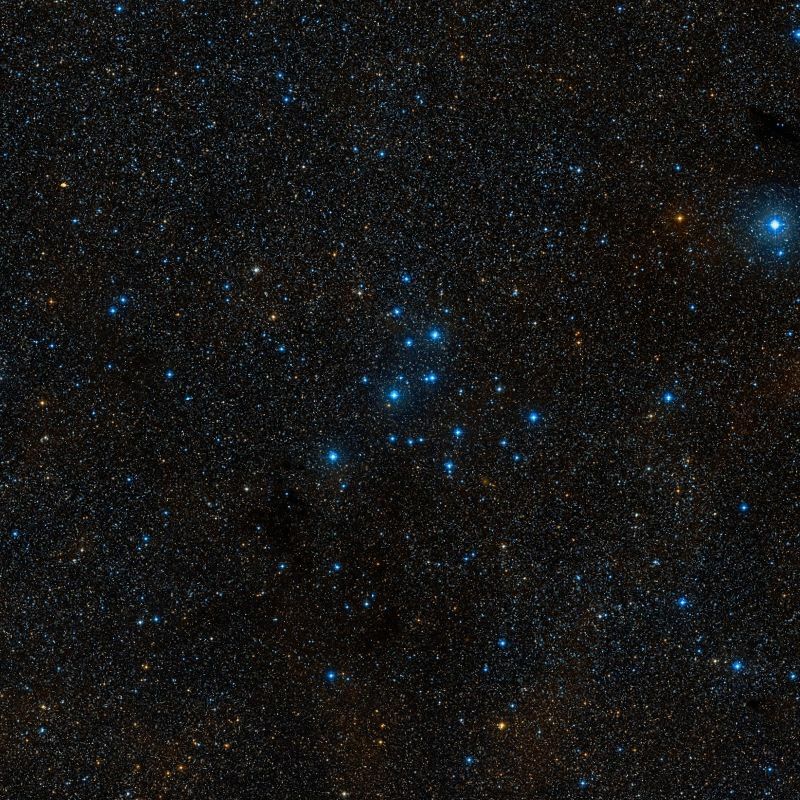 Messier 39 (M39) is a large open cluster located in the constellation Cygnus, the Swan. Messier 39 is located about 9 degrees to the east and a bit north of the bright star Deneb, Alpha Cygni. 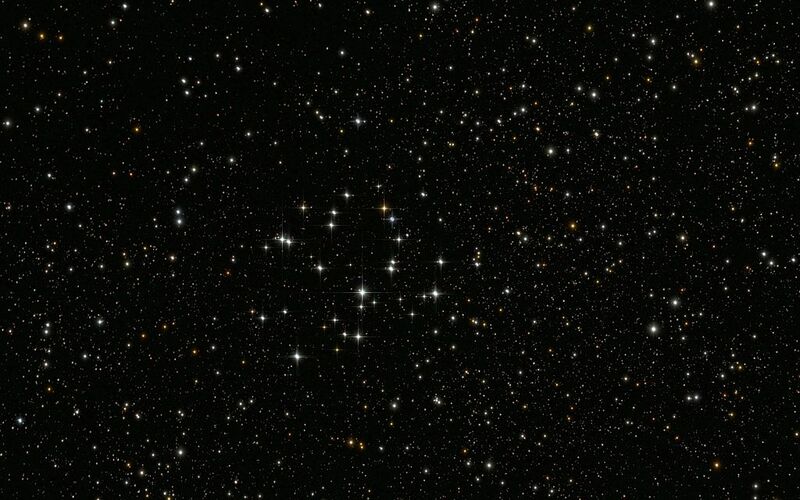 The cluster’s apparent size is 32 arc minutes, making it larger than the full Moon, which means that M39 is best observed in binoculars and small telescopes at the lowest magnifications. 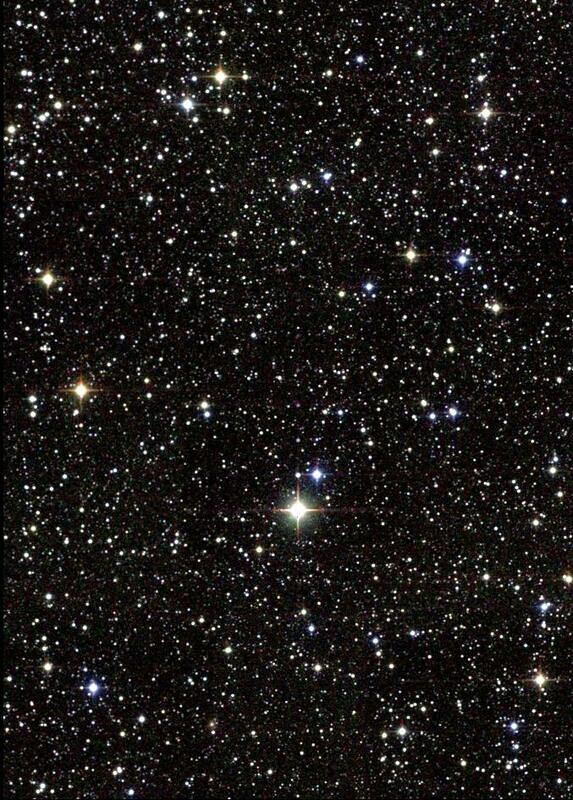 The cluster has an apparent magnitude of 5.5 and lies at a distance of 824.4 light years from Earth. It has the designation NGC 7092 in the New General Catalogue. Messier 39 can be located by star-hopping from Deneb to 4th magnitude star Rho Cygni, which lies some 9 degrees to the east. The cluster lies 3 degrees north of the star. The cluster can be resolved in 7×50 binoculars, which reveal its triangular shape, with three bright stars marking the corners. Deneb is very easy to find in the night sky as it belongs to two prominent asterisms: the Northern Cross and the Summer Triangle. It is the star marks the tail of the celestial Swan and the faintest corner of the Summer Triangle, a familiar summer asterism formed by Deneb and the bright stars Altair in Aquila constellation and Vega in Lyra. 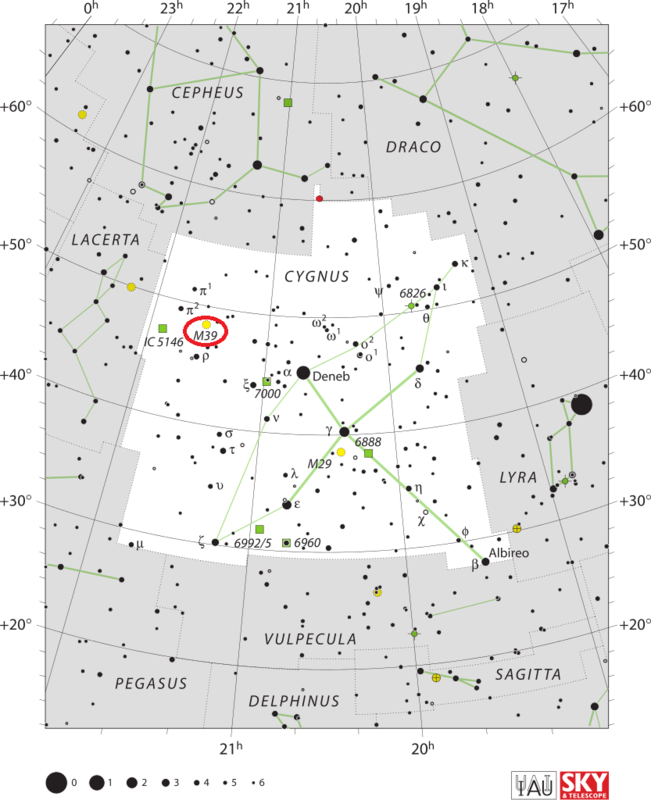 The best time of year to observe M39 is in the summer months, when Cygnus is high overhead. Messier 39 has an estimated age of 200 to 300 million years. All its confirmed members are still on the main sequence, still burning hydrogen in their core, and have yet to evolve into red giants. Messier 39 is a relatively loose cluster with 30 confirmed members occupying an area about 7 light years in diameter. The cluster is approaching us at 28 km/s. Messier 39 is classified as either Trumpler type III,2,m or III,2,p. This means that it is detached from the surrounding star field but with no central concentration (III), that the stars in the cluster have a moderate range in brightness (2), and that the cluster is either moderately rich, with 50 to 100 stars (m) or poorly populated (p), with fewer than 50 stars. Messier 39 is one of the nearest Messier objects to Earth. Only the Pleiades (M45), Winnecke 4 (M40), the Beehive Cluster (M44), and possibly the Ptolemy Cluster (M7) are closer to us. The brightest star in M39 is of spectral type A0 and has a visual magnitude of 6.83. Many of the stars in M39 are arranged in pairs. In the night of October 24 to 25, 1764, I observed a cluster of stars near the tail of Cygnus: One distinguishes them with an ordinary (nonachromatic) refractor of 3 and a half feet [FL]; they don’t contain any nebulosity; its extension can occupy a degree of arc. I have compared it with the star Alpha Cygni, & I have found its position in right ascension of 320d 57′ 10″, & its declination of 47d 25′ 0″ north. The cluster may have been discovered by the French astronomer Guillaume Le Gentil in 1750, and possibly even by the Greek philosopher and scientist Aristotle as a comet-like object around 325 BC. Messier 39. Atlas Image mosaic obtained as part of the Two Micron All Sky Survey (2MASS), a joint project of the University of Massachusetts and the Infrared Processing and Analysis Center/California Institute of Technology, funded by the National Aeronautics and Space Administration and the National Science Foundation. A loose cluster, or rather splashy galaxy field of stars, in a very rich vicinity between the Swan‘s tail and the Lizard [constellation Lacerta], due south of Beta Cephei, and east-north-east of Deneb. This was picked up by Messier in 1764, with his 3 1/2 foot telescope, and registered as being a degree in diameter. Among them there are several pairs, of which a couple were slightly estimated; the first being the brightest star (7m) and its comes, and the second a pretty pair of 10th-magnitudes.